For works new to our Library - and, presumably, new to most audiences - simply having the cast album can be essential. HEARTBEATS (Varse Sarabande), A GRAND NIGHT FOR SINGING (Varse Sarabande), WINGS (RCA Victor) and FLOYD COLLINS (Nonesuch) are a few examples. The newly-released DRG recording of the complete score for Irving Berlin's LOUISIANA PURCHASE is an ideal introduction to a surprising score which, although written in 1940, has rarely been heard until now. STATE FAIR falls somewhere between the ""unfamiliar"" and ""long-lost friend"" categories. Irving Berlin's CALL ME MADAM certainly qualifies as a long-lost friend: for years synonymous with its original star, Ethel Merman, the musical emerged fresh as a daisy in a concert staging by New York City Center's Encores! series in 1995, and was subsequently recorded by DRG Records. Star Tyne Daly proved there was life after ""the Merm,"" and as performed by Rob Fisher and the Coffee Club Orchestra, the score has proven irresistible to stock and amateur customers alike. The other great Berlin-Merman musical was never ""long-lost,"" of course: ANNIE GET YOUR GUN celebrated a banner 50th Anniversary year in 1996, a milestone noted in JAY Records' new 2-CD recording starring Judy Kaye and Barry Bostwick and featuring all of the songs, reprises, incidental and dance music from the 1966 Lincoln Center revival which is the version we license. For a choreographer especially, it is vital to have a sense of the orchestrations - where the music crescendoes; when it's big and brassy, or light and ethereal; of the percussive accents in the music. This album provides that. SHOW BOAT is an epic work that has never been ""frozen."" We license the highly popular 1946 Broadway version, which is produced several hundred times a year, and was sanctioned by its authors. The noteworthy 1988 EMI recording, however, contains an hour's worth of material cut from the original score that has us caught on the horns of a dilemma. As historians and buffs, we are grateful to maestro John McGlinn for preserving these fascinating out-takes by Messrs. Hammerstein and Kern, but as custodians of the licensed stage work we are not authorized to allow our customers to insert those numbers into their productions. As William Hammerstein stated in a New York Times interview: ""When experienced, knowledgeable people cut material from a show, it's because it's not working, and they're usually right."" Carousel: The original cast album (MCA) has two noteworthy oddities: Alert listeners will note that ""The Carousel Waltz"" played there is not the version played ever since. It had been orchestrated by Robert Russell Bennett early in CAROUSEL's creation, but no longer exists on the printed page. Don Walker replaced Bennett as the CAROUSEL orchestrator, and it is his ""Waltz"" that has lived on. Also on the original cast album is a section of Billy Bigelow's ""Soliloquy"" cut during the original Broadway run. The 1965 Music Theater of Lincoln Center recording (RCA) is more complete and, since it contains Walker's version of ""The Carousel Waltz,"" is truer to the materials we license for performance. 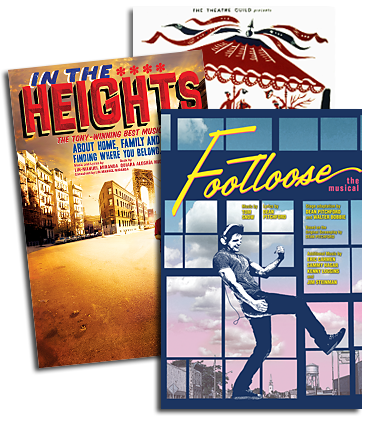 For our complete catalogue of musicals available for performance call The R&H Theatre Library at 212-564-4000 or fax 212-268-1245."